my morning cup of coffee...: Rain and California politics. Okay, so where was I going with this? Oh yeah, about the big rain storms rolling in and then I mentioned the Oroville Dam which made me think of Jerry. I actually like Jerry. That doesn't mean I approve of everything he has done with the last 2 terms. I wonder if because he is getting old, that someone isn't taking advantage of him. The prison realignment didn't sound like him, even though he is a really nice and caring guy, especially to felons. 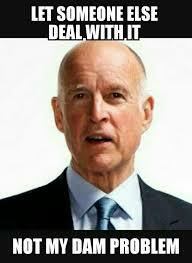 Whoa, I was just thinking it's a good thing the husband doesn't read my blog because he can't stand Jerry Brown. He knows I like him and other than that, we don't talk too much about it. It never ends well. Jerry always pisses the husband off. Okay, that's enough about California state politics - tomorrow I paint the bathroom and it will rain. Politics? Like Sgt. Schultz..."I know nothing!" Jerry, Jerry, Jerry is a unique individual for sure and California politics is definitely a source of many heated discussions that I really try to avoid... I don't think we are forecasted to get that much rain here but you never know, we will take what we get I suppose, I meant the rain not the political stuff. Politics. Ugg. Illinois is collapsing, no payments made to nursing homes for months on end and yet we see these ugly "Sound walls" being built all along the interstate near Chicago to protect the delicate ears of those living in upper end subdivisions. It's been easier and less stressful for me to deal with the local yocals here regarding building permits for barns made of used recycled wood. A plate of cookies still mans something in these parts. I have never been above a gastronomic bribe. It's raining as I'm writing this! Wonder if it will rain tomorrow? Eight years ago the folks in Michigan elected former Gateway Computers CEO Rick Snyder as Governor. The guy only cares about the bottom line. Gave big breaks to business and taxed everyone else, including senior pensions cause he said we were not paying our fair share for benefits. Despite the fact that none of us get any state benefits. Can't wait to see him gone. Oh, and did I mention the Flint water crisis?